This past month was probably my busiest yet as a pro juggler. Ever since I started performing at CGA Haunt, my Octobers are usually pretty busy, with me performing late into the night every weekend. It's been even busier this year as I started teaching diabolo in middle schools with Jester Games and DiaboloFest. I even went to two festivals, one of which I won 2nd place competing. During the week I'm busy taking an entrepreneurial business class as well as doing other things like making marketing materials and writing business plans and game design documents late into the night. I had to temporarily stop work on my indie games as I put my full time and energy into taking my juggling business off the ground. I hope to be successful enough to not have to get a regular job so I can juggle more and go around performing and teaching juggling as well as making indie games on the side. Speaking of practicing juggling, I didn't really spend much time with my usual training sessions this month. It's currently more urgent that I get a good marketing base established to try and land new gigs, especially for the holiday season which is usually the busiest time of year for performers. I started using a few gig bidding sites like GigMasters and GigSalad and am also currently looking into using Thumbtack. I've been needing to update my website to better reflect the services I offer and to put my newer videos on there. I updated my business logo and caricature to look more clean and spiffy. With the new logos I ordered some stickers to hand out to the kids at all the middle schools I'm going to start doing. 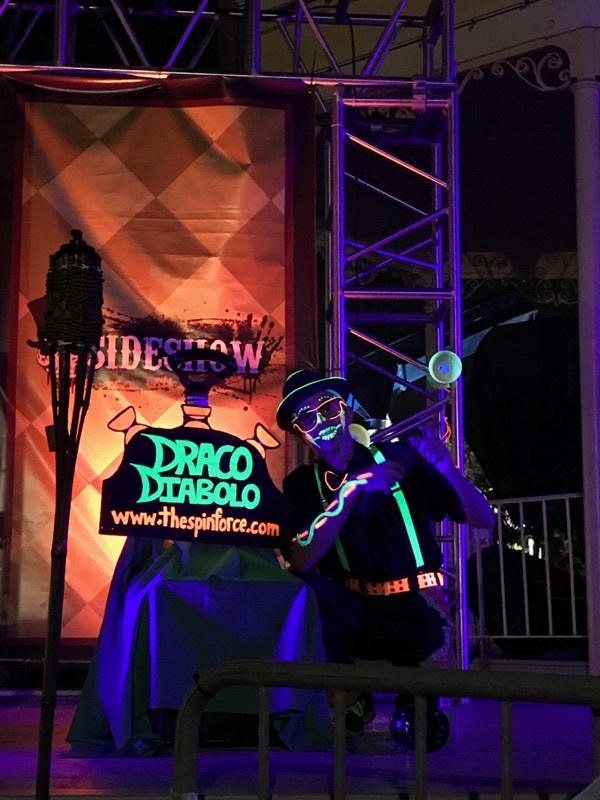 I painted a Draco Diabolo sign that glows in blacklight, which really helped when performing at Haunt. 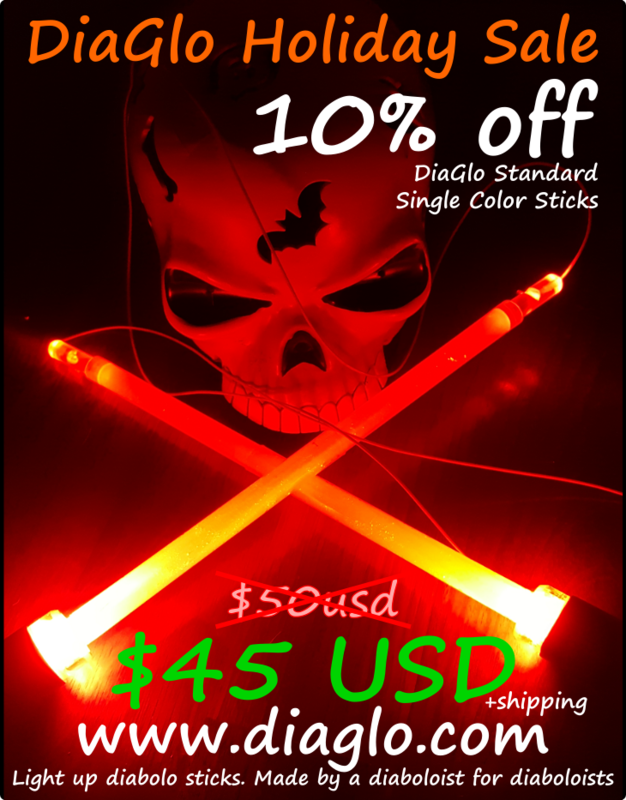 I also started a holiday sale campaign for my DiaGlo LED diabolo sticks, in hopes of making them more known among jugglers. Even though I didn't train much or learn new tricks this month, I really felt like I pushed myself as a performer. 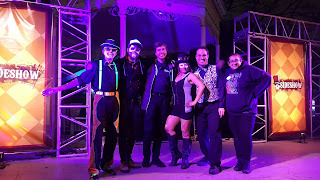 CA Great America Haunt had an awesome new stage for Sideshow this year, and since we had one less performer I was able to go on 10 minutes before my act and freestyle contact juggle and ball juggle. 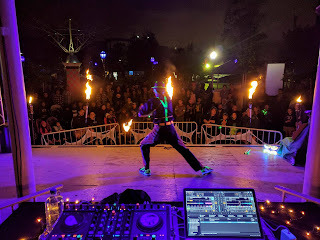 The freestyle sets to the DJs helped me to get comfortable performing to random songs and listening to beats in the music to switch between tricks, and this even started showing more and more in my choreographed 15 minute fire and light routine. I really started to get the feel for adding style and confidence in my body movements and overall stage presence, and even started to incorporate more movement and basic dance while I juggle. Oh, it was also really nice that it didn't rain at all this month for Haunt... I'll write another post soon to talk more about this gig and my past few year experiences doing it. 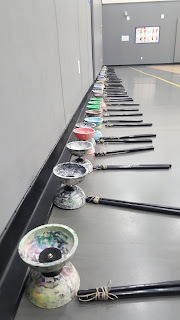 Training to do Diabolo Fest has been fun and helpful for performing as well. I went to four separate schools with Jeremiah Johnston to see how they run the program, and for the last two I had to run things while Jeremiah supervised. This gig is really helping me to get out of my comfort zone as a performer as I've always been shy of speaking, especially when performing juggling. It's pushing me to speak clearly and concisely, as well as confidently so the kids pay attention. 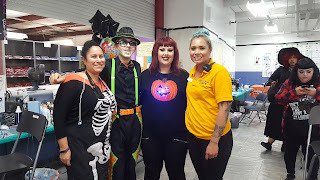 It's been is super helpful to watch Jeremiah perform and talk to the kids, he's not only an amazing juggler but also an awesome performer and strong public speaker. After going to 4 schools with him I feel pretty comfortable to start doing the schools myself and have my first solo one on November 6th in San Jose. Speaking of the festivals I went to this month, I went to the Portland Juggling Festival at the beginning of the month; this was their 25th anniversary! It was fun driving up with Cassie, Diego, and Sara and getting to see a lot of friends like Curt C., Hall Sensei, Richard H., Michael P., Brian T., Mark H., Eli M., Jeremiah J., Alexis and Victor, and many others. Thanks so much Eli March and friends for letting me stay at your house for my time up there! Some of my highlights at PJF were having a spin top jam with Mark and Curt, as well as a diabolo jam with Matt, Victor, Alexis, and Jeremiah... Oh yeah and also trying to rola bola while Brent Fiasco had a shoe and plate on his head as I attempted to throw a spintop on it. Brent, we gotta renegade that act next time! 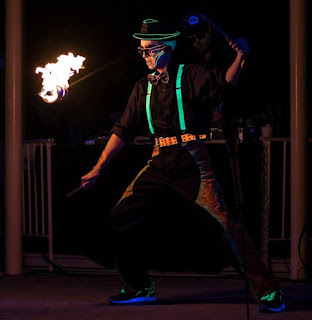 I also did a small unplanned glow diabolo act for the renegade show which seemed pretty well received despite me thinking I messed up a lot. I was a little bummed that one of the gyms got closed due to the roof collapsing, but on the plus side great job organizers for handling such a curve ball just a week before your event! The other festival I attended was the National Yoyo Contest in Chico. Surprisingly, it was also their 25th anniversary! 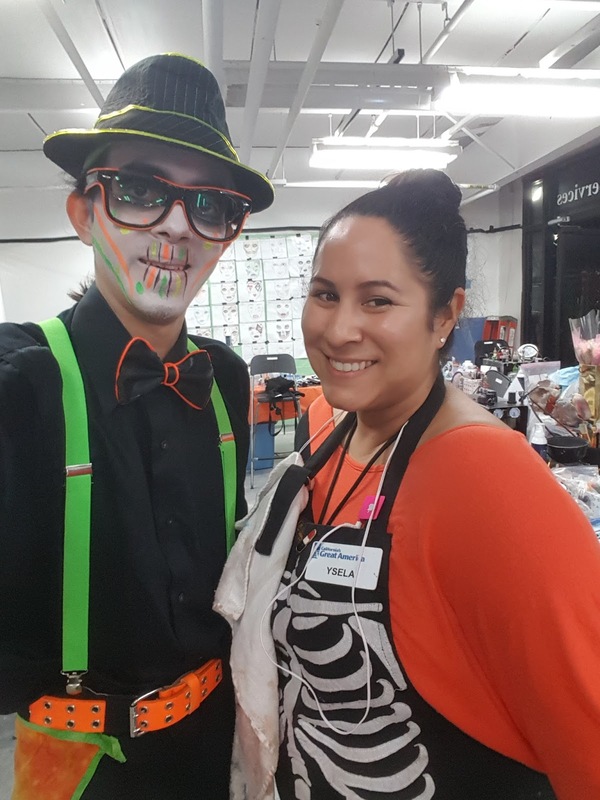 Although the event was 3 days total, I only went on Saturday as I had a DiaboloFest the day before, and Haunt the night of. I left around 6 in the morning and got to the contest around 9:30 where I checked in and talked to the organizer about doing a diabolo demo during intermission. 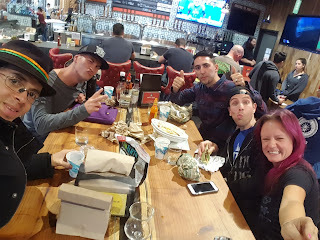 I got to see some of my yoyo friends like Josh, Everett, Ian, a few of the spin top folk and some others. 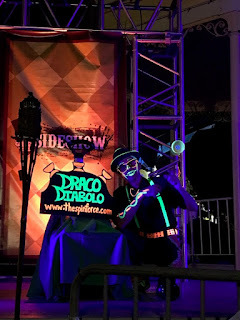 I spent a lot of the morning painting my Draco Diabolo blacklight sign so as to have it ready for when I performed. 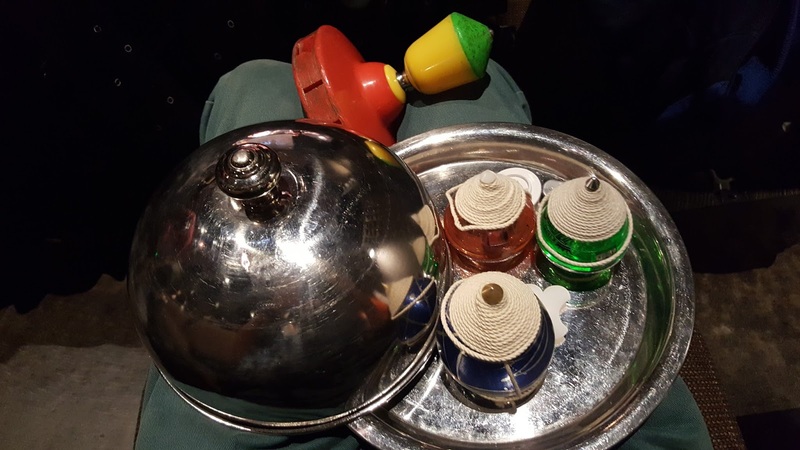 Around 2 was when they had the intermission and I got up on stage to do a diabolo and juggling demo. The diabolo demo was dropless, and juggling demo also went over well although was a bit more difficult with the blinding stage lights. Unfortunately I didn't get a chance to record as my phone was being used to play music. Afterwards I had about an hour before the Spin Top division which consisted of me and 2 others. It was fun watching the other competitors go before me so I can see what's possible with spin tops. I'm pretty new to spin tops and mostly entered so they can have enough participants to hold the tops division. 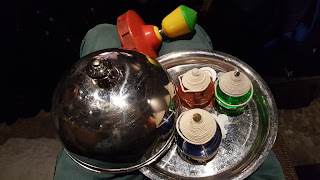 I used a regular spin top to start out with, and then my kongzhu (chinese monobolo that whistles), followed by my serving tray dome top, and then finished with me throwing another top into the spinning serving tray dome. You can watch the video of the performance here (https://youtu.be/04TEDUQgGGQ?t=3h18m10s). I then had to leave briefly after the spin top division around 5p in order to make it back to Haunt... I barely made it back in time, just enough time to get dressed and have 5 minutes before doing my fire act! Later that night I was surprised to find out from a friend that I won second place in the tops contest... totally was expecting last place. I also want to give a special shoutout to Mike Hout for sponsoring me and paying the entry fee for me to compete in the tops division. I also want to give another shout out to all of you! Thank everyone who has supported me thus far in my juggling endeavors, especially after the big incident earlier this year. It really means a lot to me emotionally and physically to have so much support in response to things. I'm feeling pretty good now a few months after my facial surgery and my shoulder is feeling pretty normal. I'm still debating on getting surgery for the shoulder, as it's mostly seemed to heal on its own but I do sometimes worry and have dreams of it re-dislocating. 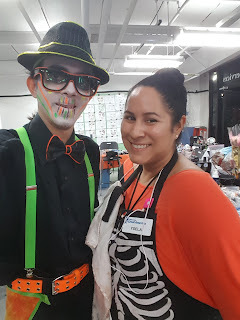 I think that's mostly it for my October recap. 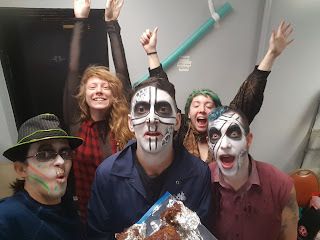 This month represented the first step forward into full time professional juggling. November is going to be a month of business and website refinement and video editing. I also plan on making improvements to the DiaGlo sticks, get more marketing things going like decals for my car, some shirts for selling, etc. I have a few school gigs coming up, and hopefully will land other performance gigs for private parties and compaines. I started using a time tracker called Toggl to keep track of what I do. Below are some metrics reported from Toggle for the month.